Of course, prosperity is beneficial. But what kinds of prosperity are there? My study of prosperity started as a spiritual alert after I rolled my jeep and walked away and lived. Since that time, I have been discovering the true nature of prosperity. In Nature, there is a perfect balance. Whatever is needed in every climate and geology, there is appropriate plant and animal life sustaining itself in perfect balance, changing with the seasons. In businesses, there are people with ideas to serve other people by providing solutions. In families, there are commitments to take care of each other. Each of these systems illustrate prosperity. By turning away from fear of limitation, we, too, can live a life in balance in every season, look for and find solutions to help serve others, and practice a commitment to take care of others. This allows us to live a life of prosperity. 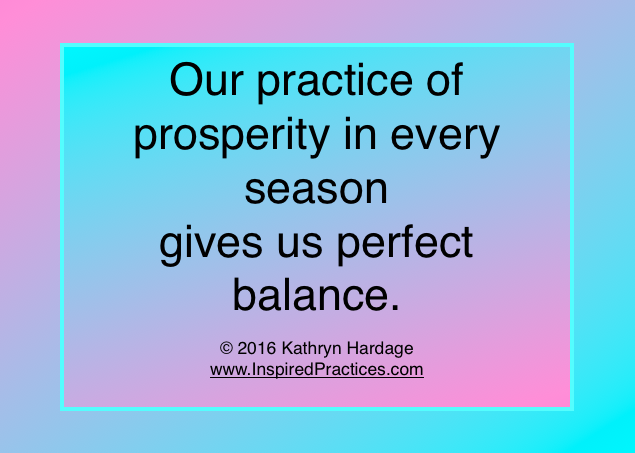 By drawing on inner resources, we can practice balance, service and commitment. Our inner awareness leads us to solutions. Taking the steps outwardly, which are provided by our inner listening, builds up a practice of prosperity.